GAZA CITY, Gaza (CNN) -- A U.S. congressional delegation visited Gaza Thursday, marking the first time that American lawmakers have entered the Hamas-controlled Palestinian territory in eight years, according to the U.S. consulate in Jerusalem. 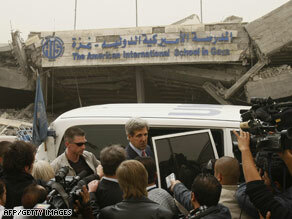 Sen. John Kerry, center, visits the American International School, destroyed by the Israeli attacks on Gaza. The delegation included Reps. Brian Baird, D-Washington, and Keith Ellison, D-Minnesota, who is the first Muslim to serve in the U.S. Congress. Sen. John Kerry, D-Massachusetts, also visited Gaza separately from the two congressmen, according to an official who was traveling with the senator. None of the U.S. lawmakers visited representatives of Gaza's Hamas leadership. Hamas is considered a terrorist organization by the United States. Baird said that the visit represents a change in the United States' attitude and approach to Gaza, under newly elected President Barack Obama. The destruction from Israel's recent military operation in Gaza was beyond description, Ellison said. The two men visited the United Nations headquarters in Gaza City, and toured homes that had been destroyed in Israel's three-week military campaign. Kerry visited the site of the American school in northern Gaza, which was destroyed in the recent conflict, his representative said. He is later scheduled to visit U.N. headquarters in Gaza City. He also visited the southern Israeli town of Sderot, a frequent target of rocket attacks launched by militants in Gaza. Israel launched its military operation in Gaza on December 27 to halt those rocket attacks. Baird and Ellison say they plan to visit Sderot on Friday. Americans have been prohibited from traveling to Gaza since 2003, when a U.S. diplomatic convoy was hit by a roadside bomb. There were two exceptions to that ban, when State Department personnel visited the Palestinian territory twice in 2005. No U.S. officials have visited Gaza since Hamas seized control of the territory in 2007, effectively splitting the Palestinian government. A day before heading to Gaza, the U.S. delegation visited Palestinian leaders in Ramallah, West Bank. On the same day of the delegation's visit, Israeli aircraft bombed six tunnels along the Egypt-Gaza border in response to several rocket and mortar strikes on southern Israel, the Israeli military said. The airstrikes caused explosions in some of the tunnels along the Rafah border crossing, the Israel Defense Forces said. Palestinian security sources confirmed the Israeli airstrike in Rafah. There were no initial reports of casualties. Israel accuses Gaza's Hamas leadership of using the tunnels to smuggle weapons into the Palestinian territory. But Palestinians say the tunnels are necessary to get basic food supplies that are not available in Gaza because of Israel's closure of its border crossings and seaports. CNN Jerusalem Bureau Chief Kevin Flower contributed to this report.